OK. We've been talking GRAVY-GRAVY-GRAVY for the last 19 days. Here's one of my favorite, and more unusual, ways to use Béchamel (remember, it's just "white sauce" nothing all that fancy). 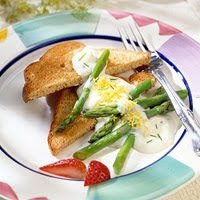 Growing up in the '60's, (yes, I'm old, deal with it) one of my favorite vegetable dishes was when my Mom would make asparagus on toast with a white sauce and chopped bits of yellow boiled egg-yolk. (I know, sounds odd maybe? But I always thought it was so "fancy" and elegant). Plus, believe it or not, my Mom rarely ever made sauces or gravies, so I was particularly in love with this dish because it had the rare and much-beloved GRAVY (or white sauce). I didn't realize it was actually a "real" recipe however; until I discovered years later (in a fancy restaurant, no less) that my childhood favorite was known by the prestigious name of "Asparagus Goldenrod" and it was STILL just as delicious as I remembered. In attempting to re-create this comfort-food memory in my now-vegan kitchen, I realized it was simply a matter of a non-dairy white-sauce and possibly something instead of the chopped boiled egg-yolks. Easy - us vegan folk tend to use tofu for eggs whenever we get the chance. (OK, not necessarily!) But it works in this case, scrambling it with a bit of turmeric for that characteristic "golden" color. First time experimenting, I nailed the recipe right on!! Next time you're looking for something just a little different, but quick and easy (perfect for brunch and sort-of retro) to do with asparagus, give this a try. 1 tablespoon snipped fresh tarragon or 1 teaspoon dried tarragon, crushed, optional, if you want. Make the "egg" part first; Mash tofu in a skillet with a small bit of oil. You want small pieces, I use a potato masher or a fork. Add spices and stir until well-incorporated, heat on medium-high and "scramble"-fry until dried out and crumbly. This takes 5 - 7 minutes. Mash a bit more to break up, and set aside. Prepare asparagus; Break off woody bases where spears snap easily. If you like, slice the spears diagonally into 2- to 3-inch pieces. Place the pieces in a steamer basket over boiling water. Cover and reduce the heat. Steam for 5 to 8 minutes or until the asparagus is crisp-tender. Meanwhile, prepare the Béchamel sauce as directed in recipe. Add tarragon if you like tarragon. Arrange 2 toast slices on each plate. Top with the asparagus. Spoon on the sauce. Sprinkle some very finely crumbled tofu (I put mine through a sieve to make it look all "egg-yolk-fancy", yes, I'm down with re-creating this dish as exact as I can) on top of white sauce. Garnish with the chives to make it look even more fancy. Serve to your 90-year-old-great-Aunt. She'll be impressed!! i've never heard of this before! your interpretation sounds delicious!